If you want to lose weight, you know that you need to eat less and to exercise more. But what makes it so darn difficult? Well, of course being hungry is uncomfortable, and exercising can be hard work. But your environment may also be sabotaging your efforts. If you make a few small but significant changes, you will find reaching your goals all that much easier. If you’ve been paying attention, you probably know that portion sizes have grown tremendously. One reason that many people haven’t noticed this increase is because the dinner plates have also expanded – from an average diameter of nine inches to an average diameter of twelve inches. Do you think this means an increase of 33% in plate size? You’re underestimating. Because we’re talking about area here, where lengths are squared, it turns out that today’s plates are 78% larger than the old ones! No surprise that ours is the fattest generation! Your best solution is to move the ridiculously-sized dinner plates to the top shelf, or to the garage, or some other inconvenient spot. And remember, you’re not depriving yourself at all. The portion sizes encouraged by twelve-inch plates are insane. By the way, the change-your-dishes rule applies to everything, not just dinner plates. Use smaller bowls for cereal. Use saucers for snacks. Use smaller platters for serving. Use smaller glasses (or tall, slender glasses). You may even want to move to a smaller table! You may think you look better in pointy high heels, and according to most of the fashion conscious, you’re right. But you probably don’t move better in pointy high heels. If your feet are comfortably shod, you will walk more easily and will therefore walk more. Sometimes this takes a little planning and forethought. You may need to keep a pair (or several) at the office. You may need to invest in water-resistant boots for rainy days. You may need to carry your glamorous shoes with you, and change them at the same time that you hang up your coat. There may be other aspects to your outfits which make exercising more or less easier. Determine what makes movement easier and wear those clothes whenever you can. Watching TV is dangerous for those who diet, for many reasons. First, most people watch TV from a sitting position. Second, TV shows are full of commercials, many of which are for food. Those ads can stay in your subconscious mind for a long time. Third, it’s really tempting to consume calories while in front of the tube. You have several things you can do. You can skip the TV altogether. If you turn on the radio instead, you can bounce to peppy music or pace to talk shows. If you have must-see TV, you can watch your shows online or on DVD and therefore miss most of the commercials (and save some time, too). Some people are extra-disciplined and exercise while watching TV. This may take a little getting used to, but you can certainly learn how to do it. You may choose a fast workout on a treadmill, or a slower routine of pacing, steps and stretches. As long as you’re moving instead of munching, that’s good. Studies show that if you hang out with people who are heavy, you tend to eat more. There are multiple reasons for this. Your heavier friends must be eating more and so socializing with them may involve more occasions with food. Another reason relates, again, to portions: the portions that heavier people eat are generally too large – and you may have learned, incorrectly, that these large portions are normal. There’s an instinctive reason – when you see your friends eating, there’s a competitive impulse to eat more so as to get your share. Finally, when you’re with heavier people, you can persuade yourself that being overweight doesn’t matter. The solution is to find some thinner people to hang out with, at least part of the time. This will help you see what portion sizes are normal and will help you build up your self control. You may feel competitive and that will goad your efforts, too. However, you don’t want to reach the point where being around them depresses you so much that when you leave them you devour a large bag of potato chips. And, as for your heavier friends, you certainly don’t want to drop them, but you want to limit their impact on your eating habits. 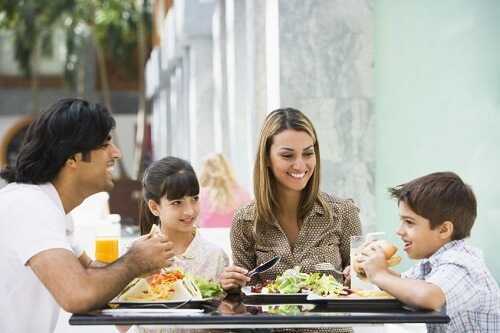 Identify the situations in which you eat too much with them, and change the settings in which you get together. Perhaps go to a concert with them, or even suggest a walk. When and if they head for a fast-food restaurant, make your excuses and depart. These recommendations will help make slimming much easier. You should also look around your own personal environment and see if you can identify other calorie-rich traps. If your surroundings are not set out to sabotage you, your chances of reaching your goals are much higher, and the number on the scales will be that much lower.